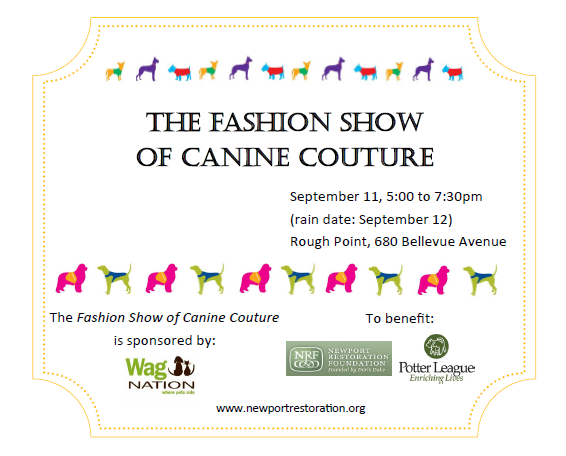 The weather is looking promising for this evening’s fifth annual Fashion Show of Canine Couture at Rough Point. All fashions will be from Bellevue Avenue boutiques and dogs will be outfitted by Wag Nation. Local residents will be the models and their four-legged friends will walk the runway on the rolling green lawn overlooking the sea. Gates open at 5pm; show begins at 6pm. Tickets will be sold at the gate ($10, $5 for children 12 and under) with proceeds benefiting local non-profit organizations the Newport Restoration Foundation and Potter League for Animals. Admission includes entry to Rough Point’s 2014 exhibit, No Rules: The Personal Style of Doris Duke, which showcases an exquisite selection of items from Miss Duke’s closet. Entry filed under: Uncategorized. Tags: canine couture, dog fashion show newport, Doris Duke, Doris Duke Fashion, doris duke newport ri, high fashion dogs, Newport Restoration Foundation, Potter Legue newport, rough point newport ri, Wag Nation Newport Ri.